The Dallas Tigers Baseball Club announces the expansion of its youth select baseball teams to Oklahoma through its affiliation with World Baseball Outreach (WBO) of Tulsa. WBO is a nonprofit based in Tulsa, Oklahoma whose mission is to guide youth on a life path that balances the mind, body and spirit and to build confident community leaders centered in Christ. 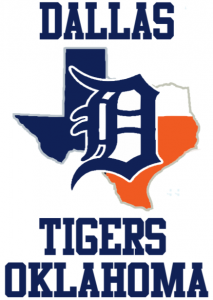 The Dallas Tigers have been recognized nationally as one of the premier youth baseball organizations in the country. More than 30 Tigers have been selected for U.S. National Teams, over 200 Tigers have gone on to play Division I College Baseball and over 40 Tiger Alumni have played in Major League Baseball. The two organizations find a common purpose to promote the game of baseball by providing an environment where boys can participate as teammates in leagues and tournaments composed of highly competitive select traveling baseball teams. Both centered around player development, they prepare their players to play at the next level through training and assembling teams to compete on a national level. Through this process, these players are able to leverage maximum exposure through a brand known for delivering solid baseball players. Oklahoma tryouts for the new Dallas Tigers teams have yet to be announced. What a weekend for Dallas Tigers 14U Polk who went out to Southaven, Mississippi and brought home the hardware. The Tigers had a tough road to sled after stubbing their toe in Game 1 of pool play on Saturday. 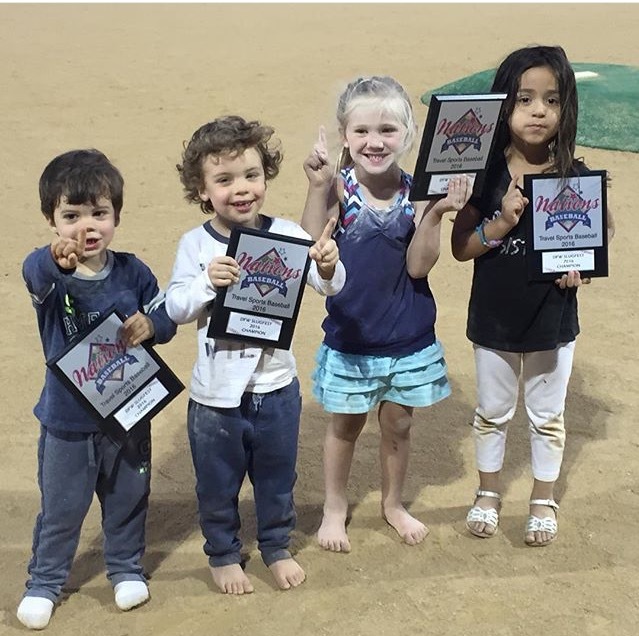 The Tigers came roaring back to run the table winning their next 6 games including beating Team Sandlot in the Championship. Way to represent the Dallas Tigers Organization fellas!!! Keep on working hard! Dallas Tigers 14U POLK swept through the PG 14U Champhionship going 5-0 on the weekend. Tigers Polk had a tough slate on Sunday meeting up with Phenom, Tigers Godwin and Texas Stix in the Championship. Dallas Tigers Baseball was represented well this past weekend with Dallas Tigers 13U Polk and Dallas Tigers Godwin meeting in the Championship. Tigers Godwin had 2 big wins eliminating Academy Select Sun Devils and Banditos Black to get to the Championship. Tigers Polk knocked off the NTX Eagles and Dallas Tigers Smith on their way to the Final game. The Final game of the weekend was tight early with both pitchers, Alan Benhardt (Tigers Polk) and Kody Clark (Tigers Godwin), going toe to toe. But in the bottom of the 4th, Tigers Polk would plate 6 runs and would go on to win the Championship. What a great weekend for Dallas Tigers Baseball!!! Way to represent boys! Tate Robbins set the tone throwing a No Hitter in Game 1 in Sunday’s bracket play. Game 2 would be a repeat match-up from the previous week. Polk would meet Baseball Nations Phenom in the semis for the 2nd time in 2 weeks. While the Tigers Polk bats were “hot” against BN Phenom, Polk got another great pitching performance from Alan Benhardt shutting out Phenom 8-0. The Championship would be an All Dallas Tigers match-up between Tigers 13U Polk and Tigers Sanchez. Hunter Marshall would shut down a great Tigers Sanchez offense only allowing 2 hits. Tigers Polk would take home the Championship 10-2. Congratulations on a great weekend boys! Keep up the good work! Dallas Tigers 13U Polk and Dallas Tigers 14U Sanchez met in the Championship! Way to represent boys!!! Dallas Tigers 13U Polk win the DFW Slugfest at Oak Grove this past weekend. Pitching and defense lead Tigers Polk to the Mother’s Day Championship only giving up 5 runs in 5 games. The Tigers beat Baseball Nations Phenom in the Semis 4-2, to meet up with Tigers Godwin in the Championship. Polk jumped out to an early lead. Tigers Godwin threatened but Polk held strong coming out with the 6-1 victory. Congrats to both Tigers Polk and Tigers Godwin on a great weekend! Tigers Polk and Tigers Godwin represent the Club over the weekend! 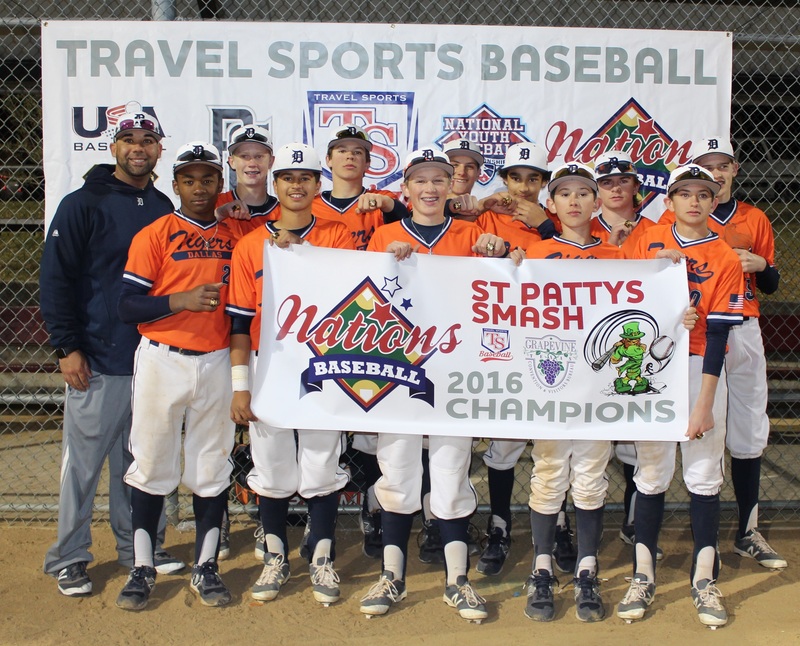 Dallas Tigers 13U Polk win the Championship at the 14UAAA USSSA Elevate and Celebrate Tournament at Baseball Nations this past weekend. Tigers Polk offense had a big weekend scoring 65 runs in 5 games. They were equally as tough on the mound and on defense only giving up 6 runs in the tournament. Congratulations boys!!! What a weekend!!! 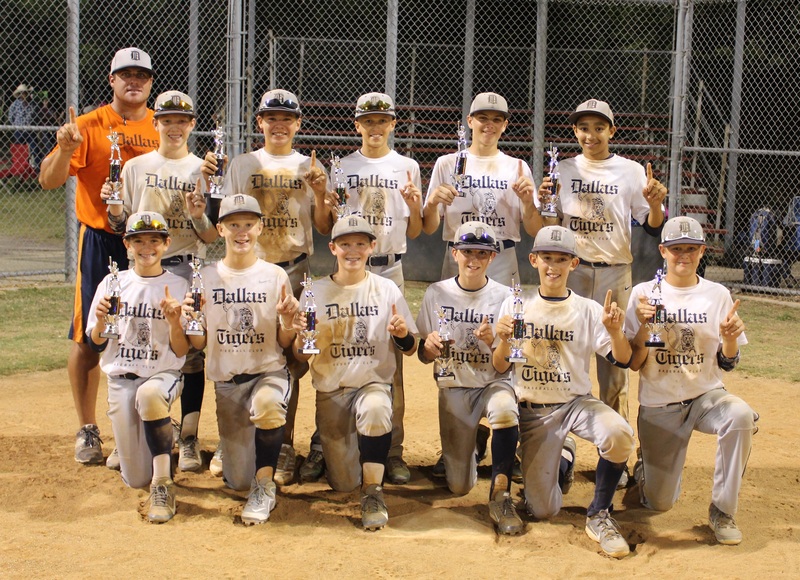 On Sunday, the Dallas Tigers Polk 13U took home the hardware at Oak Grove Park in Grapevine. The Tigers went undefeated on the weekend putting up 55 runs while only surrendering 1. It was a complete team effort throughout the tournament. Great job boys! Congratulations are in order for the Dallas Tigers 14U-Hernandez/Arias squad who took championship honors at the Matt Dozier Tournament this past weekend after downing the Texas Bombers Elite 6-3. The three keys to victory in this game were opportunistic base running, timely hitting, and stellar pitching. Chad Brown recorded the win after striking out two, picking off two and surrendering only three hits to an extremely well slugging Bombers team. Bradley Missel took the mound for the final two innings and shut the Bombers down with 4 strikeouts and two hits. The Dallas Tigers and Texas Bombers Elite each put runners in scoring position on Sunday, but the Tigers were able to capitalize on these opportunities. While the Bombers stranded 8 runners on base, the Tigers only stranded 2. At the plate, the Tigers were led by Max Lucas’s hitting. Lucas went 2-2 and scored two runs. Way to start off the season boys! Congratulations boys on a great weekend!